There was a time before the 1990s when the umbilical cord and its blood were considered medical waste. Today, parents bank or store their baby's umbilical cord blood because the stem cells it contains are currently utilized or show promise in the treatment of life-threatening and debilitating diseases. Luckily for expectant parents, cord blood can be easily collected at the baby’s birth via the umbilical cord with no harm to the mother or baby. This is why pregnancy is a great time to plan to collect and bank a baby's cord blood. Cord blood is currently approved by the FDA for the treatment for nearly 80 diseases, and cord blood treatments have been performed more than 35,000 times around the globe to treat cancers (including lymphoma and leukemia), anemias, inherited metabolic disorders and some solid tumors and orthopedic repair. Researchers are also exploring how cord blood has the ability to cross the blood–brain barrier and differentiate into neurons and other brain cells, which may be instrumental in treating conditions that have been untreatable up to this point. The most exciting of these are autism, cerebral palsy and Alzheimer's. Because the body's immune system is designed to find and get rid of what it believes to be outside contaminants, stem cells and other cells of the immune system cannot be transfused into just anyone. For stem cell transfusions of any type, the body's immune system can mistakenly start attacking the patient's own body. This is known as graft-versus-host disease (GvHD) and is a big problem post-transplant. GvHD can be isolated and minimal, but it can also be acute, chronic and even deadly. To prevent graft-versus-host disease and help ensure engraftment, the stem cells being transfused need to match the cells of the patient completely or to a certain degree (depending on what is being treated). Cord blood taken from a baby's umbilical cord is always a perfect match for the baby. In addition, immediate family members are more likely to also be a match for the banked cord blood. Siblings have a 25 percent chance of being a perfect match and a 50 percent chance of being a partial match. Parents, who each provide half the markers used in matching, have a 100% chance of being a partial match. Even aunts, uncles, grandparents and other extended family members have a higher probability of being a match and could possibly benefit from the banked cord blood. Read more reasons why you should bank cord blood. As most parents would like to bank their babies' cord blood to help safeguard their families, it is often the cost of cord blood banking that is the one reason why they do not. Most cord blood banks have an upfront fee for collecting, processing and cryo-preserving the cord blood that runs between $1,000 and $2,000. This upfront fee often also includes the price of the kit provided to collect and safely transport the cord blood, the medical courier service used to expedite the kit's safe shipment, the testing of the mother's blood for any infectious diseases, the testing of the baby's blood for any contamination, and the cost of the first full year of storage. There is then often a yearly fee on the baby's birthday for continued storage that runs around $100 to $200 a year. The cord blood bank sends you a collection kit. Kits like ours just need to be stored at room temperature. The cord blood collection kit goes with the expectant parents to the delivery center. Upon admission, the mother’s blood is collected to be tested for any infectious diseases as mandated by federal regulations. Upon birth but before the placenta is delivered, the healthcare provider will clamp and cut the umbilical cord as normal. The collection bag with the baby’s cord blood and the vials with the mother’s blood are placed back inside the collection kit. Parents call a toll-free number on the collection kit to have a medical courier—any time, 24 hours a day, seven days a week—arrange for its transportation to the cord blood bank. This is a simplified version of the steps to cord blood banking. For a more detailed overview, you can read more about the steps to cord blood banking here. There are a number of different processing methods out there for a cord blood bank to use, and the processing method can ultimately affect the purity of the final product, which we'll explain in a minute. Once the stem and immune system cells have been isolated and extracted from the plasma and red blood cell, they are mixed with a cryo-protectant and stored in a cryo-bag. We overwrap our bags for added protection and use a technique called "controlled-rate freezing" to prepare the cells for long-term storage. The overwrapped cryo-bag is housed in a protective metal cassette and placed in vapor-phase liquid nitrogen freezer for long-term preservation. As noted, there are different ways to process cord blood, and although the type of processing method doesn't always enter the conversation on cord blood banking, it is a big part of the purity of any cord blood collection. Red blood cells can have a negative impact on a cord blood transfusion. In addition, there is a certain number of stem cells that need to be present in order for the cord blood to be effective in disease treatment. Each processing method has the ability to better reduce the number of RBCs and capture more stem cells. Some processing methods like AutoXpress and Sepax are automated to ensure a level of consistency across all collections. HES is preferred by some banks because it was the original processing method used by most banks and it has a proven track record. You can read more about the different cord blood processing methods here. In terms of performance, our PrepaCyte-CB processing method has taken the lead. PrepaCyte-CB greatly improves on parents' returns on investment because it yields the highest number of stem cells while showing the greatest reduction in red blood cells.1–4 Clinical transplant data show that cord blood processed with PrepaCyte-CB engrafts more quickly than other processing methods.7 This means patients may start feeling better more quickly, may spend less time in the hospital and are less likely to suffer from an infection. The ability to get better more quickly and a reduced chance of infection can prove vital in certain cases. Learn more about PrepaCyte®-CB here. What if you want to delay cord clamping? 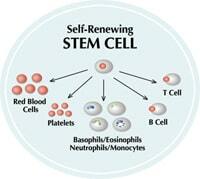 A stem cell has the potential to become one of many different cells. Another way scientists are working with stem cells is through expansion technologies that spur replication of the cord blood stem cells. 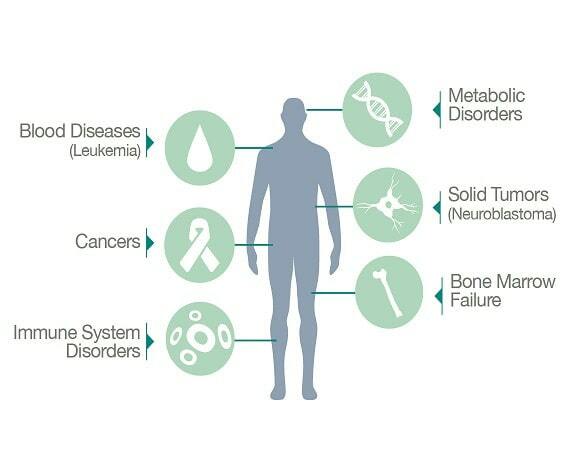 If proven effective and approved by the U.S. Food and Drug Administration, these expansion technologies will allow scientists to culture many stem cells from a small sample. This could provide doctors and researchers with enough stem cells to treat multiple family members with one cord blood collection or provide the baby with multiple treatments over time. To better prepare for the day when these expansion technologies are more easily accessible, some cord blood banks have begun to separate their cord blood collections into separate compartments, which can easily be detached from the rest of the collection and used independently. You can learn more about Cryo-Cell's five-chambered storage bag here. So how does cord blood compare to cord tissue? Cord blood contains mesenchymal stem cells but is much more abundant in hematopoietic stem cells. Cord tissue, on the other hand, contains some hematopoietic stem cells but is much richer in mesenchymal stem cells. Cord tissue, or Wharton’s jelly, is the protective layer that covers the umbilical cord's vein and other vessels. Its MSCs can become a host of cells including those found in the nervous system, sensory organs, circulatory tissues, skin, bone, cartilage, and more. MSCs are currently undergoing clinical trials for sports injuries, heart and kidney disease, ALS, wound healing and autoimmune disease. As with cord blood, cord tissue is easily collected at the type of birth and holds great potential in regenerative medicine. Learn more about cord tissue banking here. If someone doesn't have cord blood stored, they will have to rely on stem cells from another source. For that, we can go back to the history of cord blood, which really begins with bone marrow. Bone marrow contains similar although less effective and possibly tainted versions of the same stem cells abundant in cord blood. Scientists performed the first bone marrow stem cell transplant in 1956 between identical twins. It resulted in the complete remission of the one twin’s leukemia. As noted earlier, with better matching, there is a greater chance of success and less risk of graft-versus-host disease (GvHD) in any stem cell transplant. With cord blood, the baby's own cells are always a perfect match and share little risk. When using cord blood across identical twins, there is also a very low chance of GvHD although mutations and biological changes caused by epigenetic factors can occur. Other blood-related family members have a 35%–45% chance of GvHD, and unrelated persons have a 60%–80% chance of suffering from GvHD. Bone marrow and similar sources often requires an invasive, surgical procedure and one's own stem cells may already have become diseased, which means the patient will have to find matching stem cells from another family member or unrelated donor. This will increase the risk of GvHD. In addition, finding an unrelated matched donor can be difficult, and once a match is ascertained, it may take valuable weeks, even months, to retrieve. Learn more about why cord blood is preferred to the next best source, bone marrow. The first cord blood banks were private cord blood banks. In fact, Cryo-Cell is the world’s first private cord blood bank. It wasn’t until later that the government realized the need to preserve cord blood for research and public welfare. As a result, 31 states have adopted a law or have a piece of pending legislation that requires or encourages OBGYNs to educate expectant parents about cord blood banking and many states now have publicly held cord blood banks. As a result, parents have the option of banking their baby's cord blood privately for the exclusive use of the child and the rest of the family or donating the cord blood to a public bank so that it can be used in research or by any patient who is a match and in need. If you're looking to attain cord blood from a public bank, be aware that matched cord blood, as with bone marrow, can be difficult to obtain through a public cord blood bank. Once a match is ascertained, it may take valuable weeks, even months, to retrieve the match, and the cost of acquiring the cord blood from a public bank can be upwards of $40,000. When the newborn’s umbilical cord blood is banked privately, they can be retrieved quickly, and since the parents own the cord blood, banks can perform the retrieval free of charge. Learn more about public versus private cord blood banking here. Banking cord blood is a new type of medical protection, and there are a lot of questions that parents may want to ask. The Parent’s Guide to Cord Blood organization even has questions it believes all parents should ask their cord blood banks. We have answers to these and other frequently asked cord blood questions in our FAQs. If you can’t find the answer for which you are looking, please feel free to engage one of our cord blood educators through the website's chat interface. Want to learn more? We are here to answer any question you may have and can send you any information about cord blood banking that you need.